The Galapagos can be found approximately 926km off the coast of Ecuador. The island group consists of 18 main islands, three smaller islands, and 107 rocks and islets scattered along the coast of Ecuador. 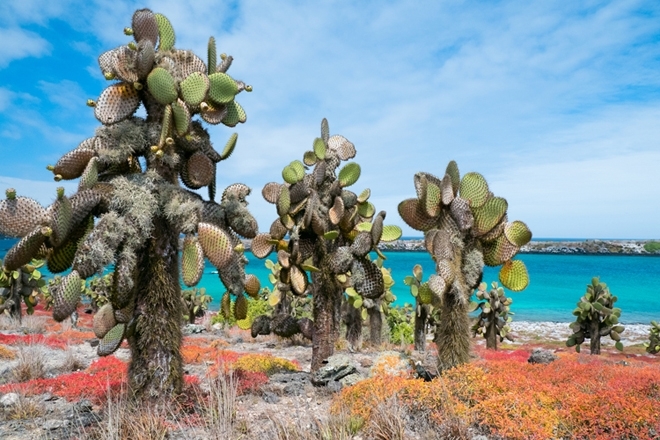 The mysterious Galapagos Islands are known for their incredibly rare and diverse plant life - much of which can be found nowhere else on earth. The islands have over 500 native plant species including four species of mangrove. This plants can be found along the edges of saltwater coves in the islands Coastal Zone. This zone spans from the oceans edge to approximately 50-100 miles inland. The Galapagos islands are home to the Galapagos penguin; the only wild penguin species that can be found living on the equator. The islands are also home to some more prevalent wildlife, these include lava lizards, mockingbirds and Galapagos tortoise. The islands are home to two airports on San Cristobal - San Cristobal Airport and Baltra – Seymour Airport.Both of these airports are used on our Galapagos trips. Volcanoes have had their place on the Galapagos Islands for at least 20 million years. The Islands are characterised by a vast number of concurrent volcanoes, with most having either plume magma or asthenosphere sources. Due to the proximity of the islands to the GSC (Galapagos Spreading Centre), structural weakness has been formed which has led to numerous eruptions creating the Galapagos Platform. The islands of Fernandina and Isabela are lie along these structural weaknesses. The highest point of the Galapagos Islands is the peak of Wolf Volcano, situated on Isabella Island. This stands at a huge 5600ft/1707m. In 1835, at the young age of 26, Charles Darwin ventured to the Galapagos Islands on board the HMS Beagle.He stay on the Islands for a total of 5 weeks, researching his theory of evolution. He studied the varied wildlife, including finches and tortoise found on the island and noted how they adapt to the harsh environment. When he analysed some of the bird specimens on his return to England, he found that many of the different birds were in fact species of finches and were unique to individual islands.Based on his findings he was able to make significant contributions to the science of evolution. The Galapagos Islands have a scarcity of natural predators resulting in the islands wildlife becoming increasingly approachable and allowing visitors to happily explore their natural habitat. A vast number of unfamiliar animals have been introduced to the Galapagos Islands – these remain the main threat to the islands. The islands native animals are quick to reproduce and, with no natural predators, thus making them defenseless when approached by introduced predators. The Galapagos Islands were added to UNESCO’s List of World Heritage in Danger in 2007. This was because the island had come under threat due to the rise in non-native species, uncontrolled tourism and over fishing. However, in July 2010, UNESCO made the decision to remove the Galapagos Islands from their list as it was evident that Ecuador had been making some significant progress in addressing these issues. 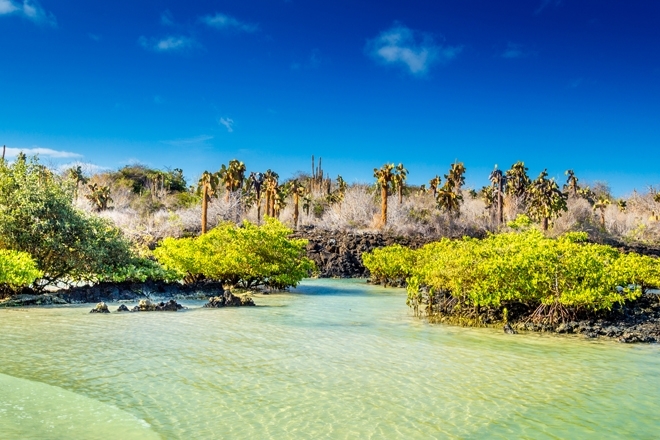 In the Galapagos Islands the months falling between December and May are considered to be the warmest and wettest, whereas the months from June to November are much cooler but remain reasonably dry. The Islands receive, on average, between 2 and 4 inches of rain per year, and the average temperature varies between 21°C and 29°C. 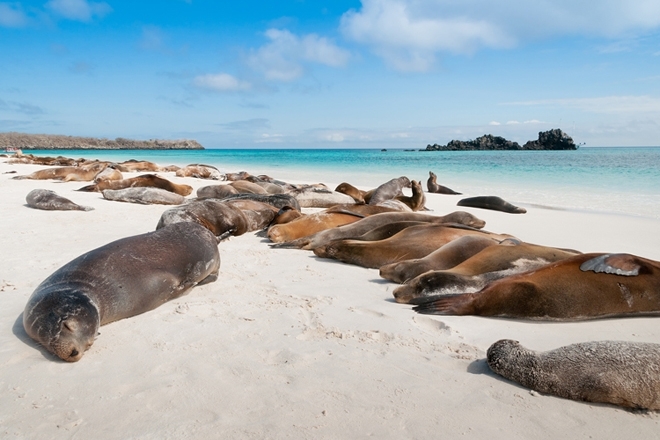 We recommend visiting the Galapagos Islands between November and April. The Galapagos Islands have a population slightly exceeding 25,000, who inhabit five of the islands; Baltra, Floreana, Isabela, San Cristobal and Santa Cruz. The Islands native language is Spanish. Discover the wonders of the Galapagos Islands for yourself on a relaxing cruise or unforgettable walking safari.